In the heart of the Luberon golden triangle, large renovated family property on nearly 5500 sqm.Entrance via the West side into the oldest part of the farmhouse, through a large living room with fireplace in a row with a formal dining room, then into a 2nd reading and music lounge with fireplace. On the side, a semi-open plan Fabre modern and fully fitted kitchen. At the back, a large utility room/scullery. The property benefits from a cloakroom with toilet and a cellar on the garden floor to the West.A beautiful staircase goes up to the 1st floor and a corridor leading to very nice bedrooms I and II, each with bathroom, and a laundry room. The staircase continues onto the second floor and onto a very large bedroom III, bedroom IV and a shower room.On the ground floor, to the East, the lounge leads to a second kitchen, then an ensuite bedroom V with walk-in wardrobe and bathroom. Attached to the building but with independent access, a studio includes bedroom VI, its bathroom and walk-in wardrobe.In front of the buildings, a beautiful stone paved courtyard, closed on 3 sides, leading to the equipped pool house with kitchen, and a heated swimming pool of 6 x 13 m with rolling shutter and stairs. On the eastern side of the courtyard, a veritable 'village square' with a fountain and a century-old plane tree, where petanque can be played or aperitif, in front of the lavenders and the lawn shaded by the various species (pine trees, olive trees , laurel, cypress trees, medlar, acacia, etc. 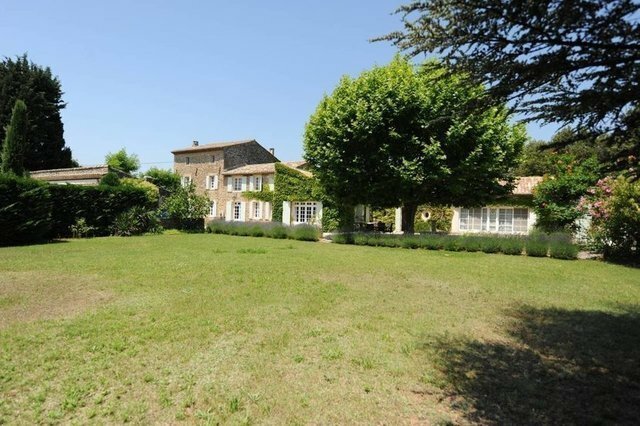 ).The property is very comfortable and benefits from a view on the garden and the Luberon.